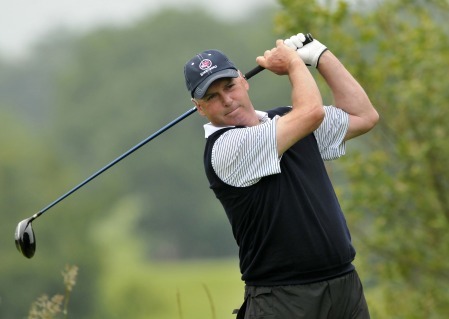 Garth McGimpsey saw off Adrian Morrow to win the Irish Seniors Amateur Open at Clandeboye. Picture Pat Cashman/www.cashmanphotography.ieGarth McGimpsey added another piece of silverware to his impressive collection when he held off a final round challenge from old rival Adrian Morrow to lift the Tourism Malaysia sponsored Irish Seniors Amateur Close Championship at Clandeboye. Adrian Morrow in action at Clandeboye. Picture by Pat Cashman. The Bangor man held a one shot lead over Billy Donlan of Birr going into the final 18 holes of the weather-curtailed 36 hole championship. But it was Morrow of Portmarnock who would challenge McGimpsey, and in a nip and tuck final day, the two rivals were tied after 34 holes of golf. On the index 18, par four 17th hole, both found the fairway with their drives. Morrow played into 25 feet while McGimpsey applied pressure, giving himself a thee foot putt for birdie. Morrow left his putt on the high side, and subsequently horse-shoed out with his par effort, leaving the easiest hole on the course with a bogey while McGimpsey duly holed out to take a two shot lead down the last. Again both players found fairway off the tee, and Morrow had a glimmer of hope when McGimpsey’s approach missed the green to the right, landing in a gorse bush. But it was the Bangor man’s day when the ball hit the centre of the gorse bush and came back out to finish in the rough, giving him a shot into the green. Morrow put his approach into the greenside bunker at the front left, and both made bogey fives to give McGimpsey a two shot win and another trophy to go with his British Amateur title, an Irish Close (1988), three North of Ireland titles (1991, ‘92, ‘93), three East of Ireland wins (1988, ‘94, ‘98), four West of Ireland victories (1984, ‘88, ‘93, ‘96) and last year’s Irish Seniors Amateur Close. Garth McGimpsey with the trophyKilliney’s Nigel Duke won the over 60’s trophy, Cork’s Peter Cowley took the over 65’s and Portmarnock’s Hugh Mackeown the Over 70’s trophy. Garth McGimpsey is bidding for a third successive Irish Seniors Close title. 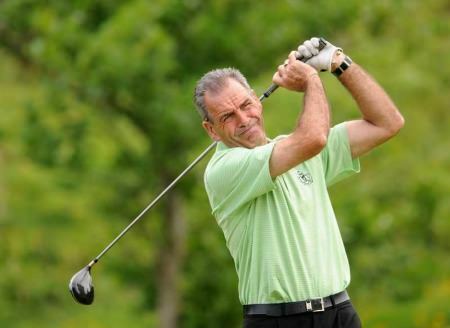 Picture © Pat CashmanGarth McGimpsey remains on track to win his third Tourism Malaysia-sponsored Irish Seniors Close title on the trot after a hard-fought 75 left him just four shots off the pace in near-perfect conditions at Portumna Golf Club. Hugh Smyth is tied for the lead at Portumna. Hat-trick seeking Garth McGimpsey will go into the final round of the Irish Seniors Amateur Close just two shots behind pacesetters Michael Quirke and Hugh Smyth at Portumna. Garth McGimpsey romped to his third successive Irish Seniors Amateur Close title at Porrtumna. It may be a cliché, but the winning shot of the Irish Seniors Amateur Close Championship for 2013 was the shot of a champion, and it came from Garth McGimpsey, who brilliantly sealed a third successive title with a superb three-under 69.